Now that Fall is here – everyone (including me) is crazy once again for Pumpkin Spice! It’s everywhere! But, not all of these treats and snacks with pumpkin flavor are healthy for you. One of the most popular is Starbuck’s Pumpkin Spice Latte and it has a ton of sugar (49 grams!!!) and fake ingredients. 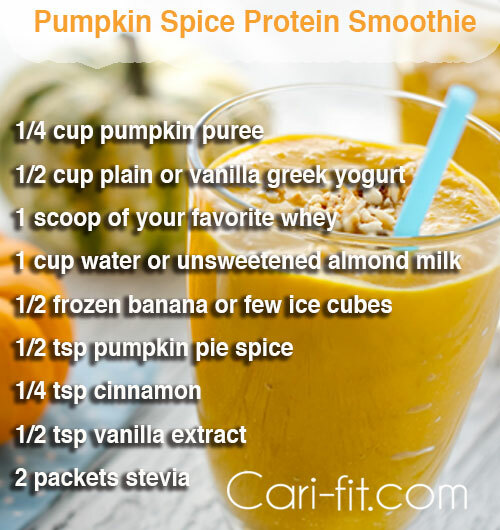 So, instead of ruining your clean diet – try my Pumpkin Spice Protein Smoothie! It’s a great treat for a mini meal or breakfast. 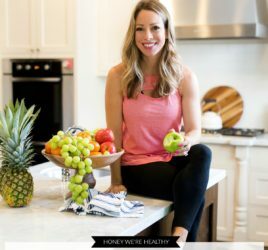 You can adjust the sweetness by adding more Stevia or even some honey and you can make it thicker by adding more ice or frozen banana. You can cheat a little by using Chobani’s Pumpkin Spice Greek Yogurt (instead of plain for extra pumpkin flavor) if you want! Also, see below for my favorite alternative to Starbuck’s Pumpkin Cream Cheese Muffin! Last week I caved in and had a few bites of a Pumpkin Cream Cheese muffin at Starbucks, even though I knew it was BAD! Then, later that week I happened to try one of Karmaffins Apple Cinnamon muffins (I got mine at Whole Foods in the freezer section) and I thought it tasted very similar! I just heated mine up and added a little cream cheese and it tasted just like a perfect fall muffin! The best part is that they only have 130 calories and 9g of protein! HWH Fitness Challenge - Round 2!